Just an extremely normal radar loop of a tropical cyclone over Indiana. The early start to hurricane season continues with what could be the first landfalling tropical cyclone to make it to Lake Michigan on record. 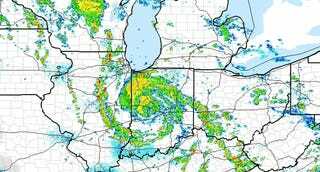 Tropical Depression Alberto has been the weird storm that could, improbably moving from the Gulf of Mexico to Indiana. The last advisory the National Hurricane Center (NHC) issued for the storm, which came at 4 p.m. Central Time, noted that flash flood watches associated with the storm extend across the Appalachians from Georgia to Virginia. The storm already triggered flooding in North Carolina earlier on Wednesday. But the real weird part is where Alberto is centered, 70 miles south of South Bend, Indiana where the outer bands are already bringing rain to the city. South Bend itself is about 25 miles southeast of Lake Michigan, and the storm’s current track could clip or even make it all the way to the lake. That would make Alberto the first tropical system to ever hit Lake Michigan’s shores (h/t hurricane expert Brian McNoldy). Beyond Lake Michigan, only seven tropical systems have ever made it to the Great Lakes according to data on historical hurricane tracks maintained by the National Oceanic and Atmospheric Administration. All have struck Lakes Huron, Erie or Ontario, the three easternmost lakes. Of the tropical systems that have made it that far north, three even managed to hit the lakes as tropical storms. In comparison, Alberto is quite a bit weaker. It’s currently a tropical depression with maximum sustained winds of 30 mph. But its present status just adds to Alberto’s strange tale. The storm has been a meteorological oddity since its inception in the Gulf of Mexico. It spun up there as a subtropical storm, borrowing elements from tropical weather like hurricanes and extratropical weather like nor’easters. The storm made landfall along the Gulf Coast over the weekend in its subtropical form. But rather than petering out or going full extratropical, the storm made a bizarre transition to a tropical system over land. On Tuesday, the NHC began calling the storm Tropical Depression Alberto. Since then, it has chugged through the Midwest with heavy rain bands swirling around its center. The storm could be maintaining its tropical nature through “brown ocean effect,” a gross-sounding meteorological phenomenon where waterlogged soil can mimic the ocean and provide fuel to storms (Marshall Shepherd, the atmospheric scientist who helped coin the term, has a great primer on it if you want to geek out). Regardless of whether it makes landfall (or is it waterfall?) on the shores of Lake Michigan, Alberto has been a whacky kickoff to hurricane season. Correction: This article has been updated to reflect the fact that three tropical storms made it to the Great Lakes, not three hurricanes. An unnamed 1893 hurricane made it to within roughly 30 miles of Lake Ontario, the closest a storm of that strength has gotten.